5 Easy Questions is an interview is designed to be quick, easy, and fun. Today's guest is Vicki Batman. I love hamburgers and with 3 other friends, we try different burger restaurants. Painfully shy until about age 15. Then I began working and getting praise which naturally boosted my self-esteem and image. "Life should Not be a journey to the grave with the intention of arriving safely in an attractive and well-preserved body, but rather to skid in sideways, chocolate in one hand, champagne in the other, body thoroughly used up, totally worn out and screaming Woo-hoo, what a ride!" Boyhood—follows a boy for twelve years. It is interesting how he changes over time physically. What happens to him and his family. Allan Charles Wellborn has secretly adored Hattie all his life. He evolved from a pocket protector-wearing geek to a handsome police detective. When the police determine there's more to the death of a former Buy Rite employee, he steps in to lead the investigation. Overly dedicated, always perfect, he puts his job first, even if doing so ultimately hurts the one he loves. Wow Vicki that is one long quote. Good to see ya here though. Good luck with the book. I've read parts of this book and it's fun. I've got my copy and now I need time to read. yeah!!! Sylvia. And thank you. I hope you like it. 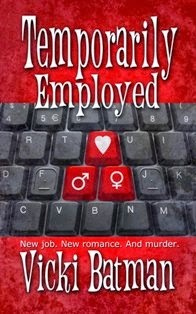 You know I like Temporarily Employed. Wishing you loads of sales. I have an Irish Reel as my main ringtone. My Hubby's ringtone is a loud, old fashioned old phone ring. I can't ignore that one, LOL. Hi, Phyllis! And thank you. *am smiling* really big regarding TE. Those are good tones. Handsome has a horrible foghorn alert for his alarm clock. Ick!! Hi Mrs. N! I love hamburgers. Love, love, love. I just tried one called Larkburger (no, no meadow larks were harmed in the making of the food. lol) The meat is very fresh and a small fat patty over the skinny frozen ones we are used to seeing. My group gets a good laugh and lots of great food through our burger adventure. I'm so glad you can relate to Hattie. Let me know what you think. Hugs! Hi, Angela! and thank you. Nice and easy and a good tease from Temporarily Employed, too. Hugs.